The Classic L88 427 Updated For The 21st Century! 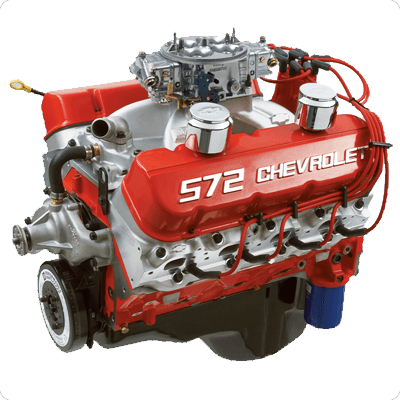 The L88 427 was the ultimate expression of Chevy’s production Big-Block power, combining a rigid iron cylinder block with lightweight aluminum cylinder heads and a single, four-barrel carburetor. Our engineers have recreated that classic, raspy rat engine, but with updated components that enhance drivability – and performance! Our engine assembly features the latest-generation block casting with four-bolt main caps, an all-forged rotating assembly for exceptional strength and durability, and a hydraulic roller camshaft instead of the original L88’s flat tappet cam, for greater drivability and a broader performance range. It also features aluminum oval-port cylinder heads with 2.19/1.88-inch valves and a pump-gas-friendly 10.0:1 compression ratio. Whether you’re building a ’69 COPO Camaro resto-mod tribute, a modified mid-year Corvette or a street-tire class winner, this heritage-inspired crate engine delivers the performance that built the Big-Block’s legendary reputation. It's 1970 all over again! 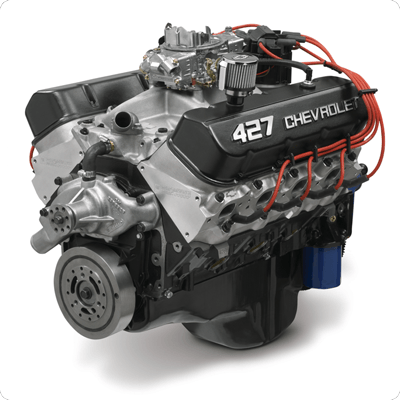 Chevrolet Performance’s 454 HO crate engine is a classic in its own time, offering enthusiasts an affordable Big-Block combination with performance specs that will make you think it’s 1970 all over again – with 425 horsepower and 500 asphalt-wrinkling lb.-ft. of torque. 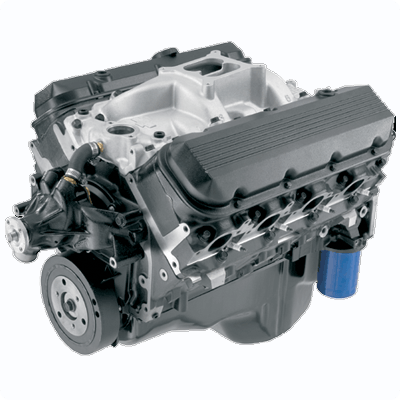 The foundation of the 454 HO is a brand-new, updated cylinder block, which incorporates many strength and performance design enhancements – making it a smart and economical alternative to rebuilding. We also add an all-forged reciprocating assembly for maximum durability, a roller camshaft and a set of rectangular-port iron cylinder heads. We deliver the 454 HO with a water pump, balancer, 14-inch flexplate and aluminum intake manifold. 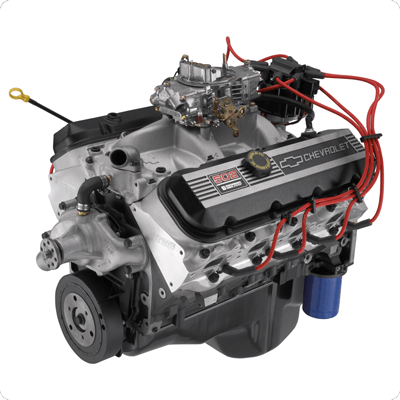 Add a carburetor, ignition system and starter and your budget Big-Block will be ready to roar. 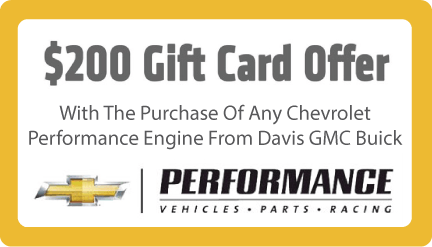 All of the necessary parts are available from Davis GMC Buick. 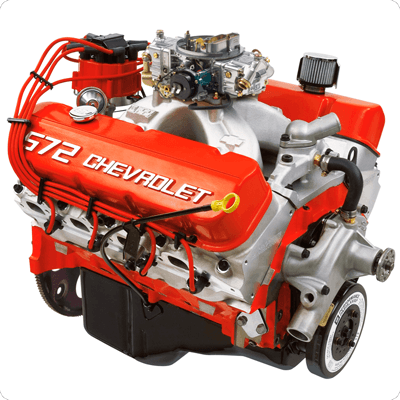 Chevrolet Performance’s ZZ502/502 is one of the industry’s benchmark crate engines, offering excellent value with a proven combination of performance that is suitable for the street or strip. With more than 500 horsepower and 580 lb.-ft. of torque, it demands your full attention and a chassis that is strong enough to harness its frame-straining twisting power. Our ZZ505/502 Deluxe package comes complete from the oil pan to the carburetor, including an HEI distributor, plug wires, starter, water pump, balancer and an aluminum intake topped with a Holley 870-cfm four-barrel. Affordable Big-Block Performance with huge torque and 450 HP! What will you do with 461 horsepower and 558 lb.-ft. of torque from Chevrolet Performance’s value-driven 502 HO crate engine? Whether you use it on the street, strip or even pulling a trailer with your workhorse truck, its performance range offers unlimited possibilities. In fact, it makes nearly 500 lb.-ft. by only 1,500 rpm, meaning it has all the low-rpm grunt you can use! To support all that torque, we build this Big-Block with our latest-generation block casting with four-bolt main caps and complement it with an all-forged rotating assembly for exceptional strength and durability. A hydraulic roller camshaft is used for excellent drivability and a broad performance range, and an 8.75:1 compression ratio is suitable for regular pump gasoline at all altitudes and engine loads. Our crate engine assembly includes an aluminum, dual-plane intake manifold, a water pump, 14-inch flexplate, balancer and more. 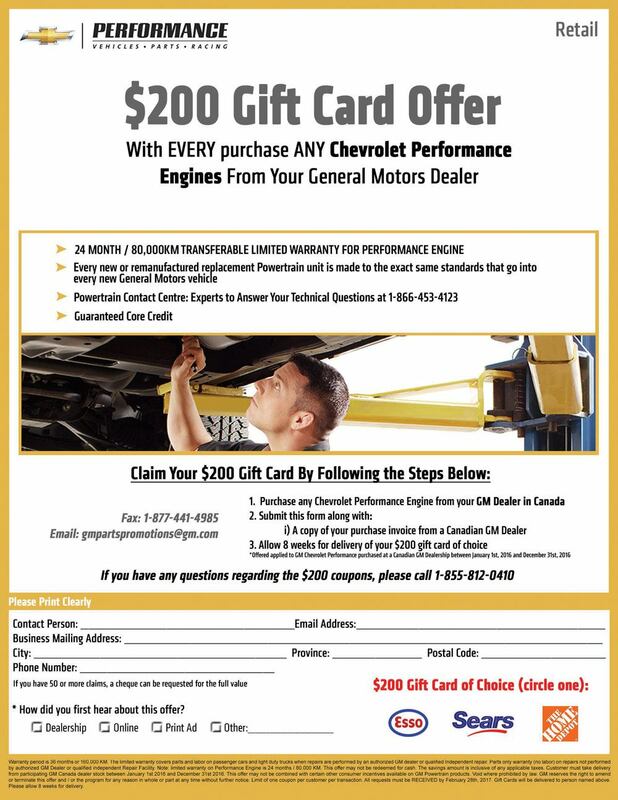 You add the carburetor, starter and ignition system – all available from Davis GMC Buick, Medicine Hat. The Most Powerful Big-Block Street Engine From Chevrolet Performance! The ZZ572/620 is the ultimate expression of Chevrolet Performance’s engineering capability. We build the ZZ572 with huge 4.560-inch bores and add a forged 4.375-inch-stroke crankshaft. To make sure those cylinders are packed with every cubic centimeter’s worth of atmosphere, we use a camshaft with incredible 0.632/0.632-inch lift and 254°/264° duration specifications. Aluminum rectangular-port heads with 310cc intake passages complement the airflow capability offered by the big-bore bottom end. They also feature 118cc raised exhaust ports and 118cc combustion chambers. The valves are big, too – measuring 2.250 inches on the intake side and 1.880 inches on the exhausts. Davis GMC Buick delivers the ZZ572/620 Deluxe with an 850-cfm carburetor, HEI distributor, aluminum water pump and distinctive orange powder-coated valve covers that proudly proclaim the 572 legend. The R Stands For RACE! An Assault Weapon for the Strip! Don’t wait weeks or months for a custom drag racing engine. The ZZ572/720R is the king of all Rat engines and is capable of pulling your bracket racer or heads-up challenger down the drag strip in the 9-second range. We deliver it fully assembled. You simply bolt on the included Dominator-style 1090-cfm carburetor, along with a starter and fuel pump (not included) and you’re ready to go! With 727 hp at 6,300 rpm and 680 lb.-ft. at 4,900 rpm, you’ll make quite an impression. The engine assembly is all-business, starting with a latest-generation tall-deck block casting with four-bolt main caps, and an all-forged rotating assembly for exceptional strength and durability. A unique mechanical roller camshaft with 0.714/0.714-inch lift and 278/282-degree duration specifications complements high-flow aluminum rectangular-port cylinder heads with massive 310cc intake passages, 118cc raised exhaust ports and 118cc combustion chambers, moving big air through the engine efficiently to make huge power!